A recent study asked 859 families about the food allergy care they received from their allergist and pediatrician. Some of the questions were about the way they were treated. Other questions were about the information they were given. The results showed both good news and bad news. Nearly all said that they were treated with courtesy and respect. They also said that the doctor listened to their questions and concerns. When to use the epinephrine auto-injector – Sixty-eight percent of allergists and 37% of pediatricians explained when to use epinephrine. Epinephrine is the medicine that is the first treatment for severe allergic reactions, or anaphylaxis. It comes in an auto-injector that makes injection easy. How to use the epinephrine auto-injector – Only 47% of allergists and 20% of pediatricians explained how to use the epinephrine auto-injector. 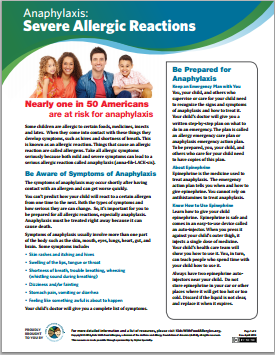 Written emergency plan – Fifty-six percent of allergists and 24% of pediatricians provided a written emergency care plan. An emergency care plan describes allergy symptoms for the child who has allergies, and tells caregivers which medicines to give when. The study also found that the child’s age and type of allergy affected communication. Allergists were more likely to explain when and how to use epinephrine if the patient was a young child. Pediatricians were more likely to provide this information when the child was allergic to peanuts versus other foods. Currently the only treatment for severe food allergies is complete avoidance of the food. Because completely avoiding common foods is extremely hard, food allergies affect every aspect of the family’s life. Families must learn how to keep their child safe at home and school, in social situations, when traveling, and so forth. When and how to use the epinephrine auto-injector – This makes me nervous. Can you please explain (or remind me) when I should be using it and how to use it? Having enough epinephrine auto-injectors – How many auto-injectors are you prescribing? I need to have two at home, two at school, two at daycare, etc. Written food allergy management plan – I worry that I won’t remember everything. Can you please give me a written food allergy management plan that I can refer to later? Resources to review at home – Do you know of any resources that would help me? Be sure to ask your questions about food allergy management first. Don’t wait until the doctor is walking out the door. Then repeat things back to the doctor (or other medical provider). This will help ensure you did not misunderstand. Plus, you should know that Kids With Food Allergies has many free resources to help you manage your child’s food allergies on our mobile-friendly website. Bring our handouts with you to the doctor’s office, or check it out on your mobile phone. ¹Ruchi S. Gupta, MD, MPH, is an Associate Professor of Pediatrics and the Director of the Food Allergy Outcomes Research Program in the Center for Healthcare Studies at the Institute for Public Health and Medicine at Northwestern University’s Northwestern Feinberg School of Medicine. She is also an attending physician at the Ann and Robert H. Lurie Children’s Hospital of Chicago, and the author of The Food Allergy Experience. ²Clifford Bassett, MD serves on the Medical Scientific Council for the Asthma and Allergy Foundation of America. He is an Assistant Clinical Professor of Medicine at the NYU School of Medicine, and is on the teaching faculty of Cornell Weill Medical College. Dr. Bassett is a frequent health contributor in television, radio and print media. Blumenstock, Jesse A., et. al. (2016). 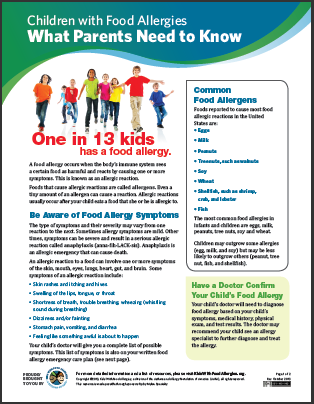 Parent report of food allergy management by pediatricians and allergists. The Journal of Allergy and Clinical Immunology: In Practice.